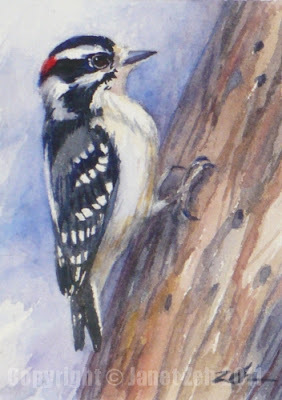 The bird series continues with a little woodpecker suggested by several people. I did not know the Downy was so popular! But it's not surprising, after all. They are really sweet little birds. The Downy Woodpecker looks like a smaller cousin of the hairy woodpecker which has the same markings, but is larger and has a large bill compared to the Downy's small bill. These two are the only woodpeckers with a white back. The female is identified by the lack of a red patch at the back of her head. Downy woodpeckers appear occasionally at my bird feeder. Their habitat includes forests and woodlands, river groves and shade trees all of which we have in abundance here. Thanks for stopping by today to check out our latest bird! 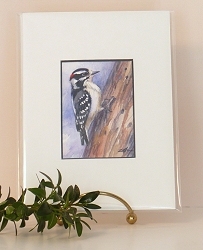 If you have any suggestions for bird paintings, please let me know. You can check my Etsy shop for more small paintings: http://JanetZeh.etsy.com. Would it bother you if I had this converted into a tattoo? It's absolutely beautiful. Hi Rosemin, I'm glad you like the painting. If you are selling the tatoos, please contact me via the contact link on my blog to discuss licensing the artwork. Thanks for the nice comment!